April's update brings some more B & G pieces for you to enjoy, plus some B & G documentation from the earlier days of the company. But, first things first, if you just happened to read in our February update that only 2 copies of the Last Supper existed, and then wondered how the one you've got hanging on your wall came to be there, then, we have the answer for you. Just check our first piece (top left, below) for a full explanation of how a simple error caused so much confusion. Before we begin our April "B & G" update information proper; let us admit to a few, shall we say, red faces, in our editorial team when several people got in touch with us recently to say that they also owned a copy of the B & G Last Supper wood inlay picture! We stated in our February update that there were only two Last Supper pictures produced by B & G. Unfortunately that statement was not accurate, to say the least. It seems that an error occurred when the translation from German to English of a document sent to us somehow changed the significance of "two pictures Otto Chlup personally dealt with", to, "two pictures only in existence!" Well, as we now know, there were approximately ten or so examples of this title produced by B & G.
So, it's apologies all round from your editorial team for that piece of unintentionally missleading information. We hope it hasn't confused you too much. Nonetheless, a copy of the B & G Last Supper did actually sell at auction for over $2,000 eighteen months ago, so, at least that part of the information was accurate. As to the two copies of the Last Supper that Otto became involved with (and which caused the confusion) the first of them was a copy that resided in a Church in Switzerland which, due to its age, needed cleaning; and the second one was where Otto personally delivered a copy of the picture to the Canadian Air Force for that Country's Prime Minister. Luckily for us, a quick word with Otto cleared up the confusion, so we hope you find the info we have now given you has made things more understandable, especially if you do happen to own a copy of the B & G Last Supper! Now that we have got that extremely rare error out of the way!! - we can get back to chatting about the latest B & G items you have sent into us. For this April update we have selected four interesting items to talk about. The first one we will deal with is the portrait at the top of this page. 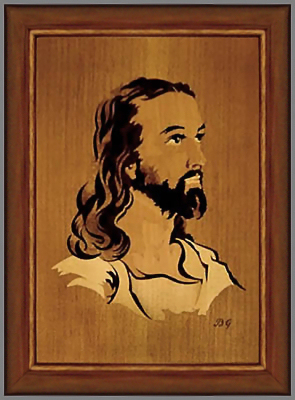 The displayed wood inlay piece was made around 1965 and was titled "Christ Head" (Christus Kopf). A companion piece to this wood inlay was titled "The Praying Hands". This was an interpretation of the original drawing by Albrecht Duerer who was a rather famous medieval German painter. Item number two this month features the label from the rear of one of those Last Supper pictures that we thought didn't exist! Obviously it patently does, as evidenced by the very existence of the label. However, the label offers us some very useful advice as to the make up of the picture. Thanks to Dianna Eisenhauer for sending this in to us. 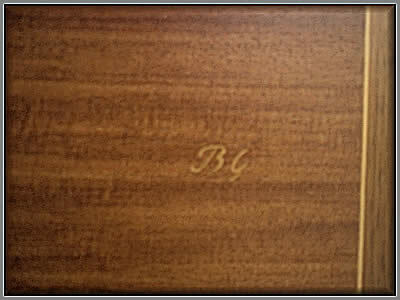 Such things help to further our knowledge of the Buchschmid and Gretaux Wood Inlay Company. The third item from this month's B & G selection is a beautiful floral display owned by Nancy Briggs. Buchschmid and Gretaux did not produce that many floral designs, they mostly concentrated on local scenes from in and around their own area. Mind you, it has to be admitted that their particular area of historic Germany is genuinely picturesque, so, as far as that goes, they were already in an enviable geographic position, lucky fellows! Anyway, getting back to Nancy's B & G floral picture. Close study of the leaves and petals shows a well chosen veneer selection for the task. From first estimates the veneer chosen would appear to be "Sen". 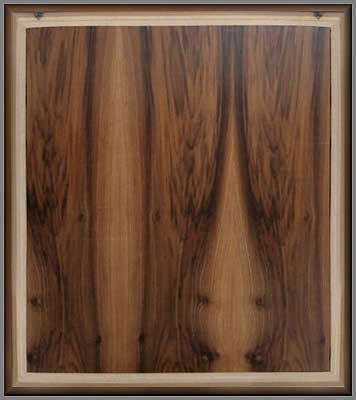 This veneer is also known as Japanese Ash. It is straw coloured with mid brown lines reminiscent of those very distinctive patterns found in the well known Zebrano family of veneers. 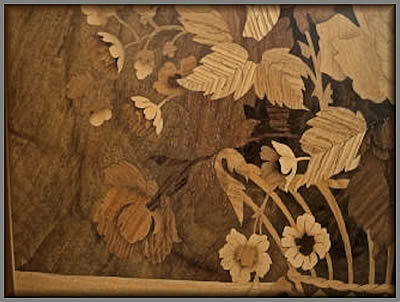 The natural lines in this veneer replicate the veins in the leaves in a very convincing fashion. Something rarely used in B & G work is sand shading (or scorching). For this floral display however, B & G have sparingly used a modicum of sand shading to represent the curved shapes found, sort of, randomly in every leaf. The important thing with sand shading is not to overdo it. Sublety is the name of the game here, it should be more of a suggestion rather than obvious. If used too heavily it will look like someone has aimed a blow torch at it and burnt it to a crisp! You don't want it resembling a piece of charcoal - all you want is a slight vague, but controlled, darkening that convincingly resembles some shadowing. It is very pleasing to note that Messrs Buchschmid and Gretaux had got the technique down to a fine art. 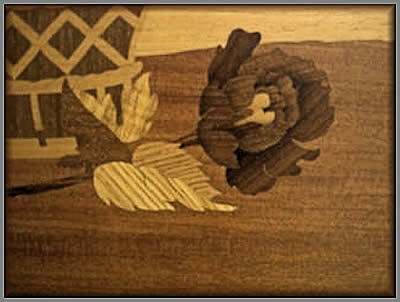 There is no carbonized veneer noticeable in the sand shaded areas of the B & G pictures, especially this floral subject. So it's hats off to B & G for a job well done. On the subject of 'well done', another accolade to be sent B & G's way, is for the selection of the veneer for the rear of the picture. There is no 'scrap' or spare waste veneer used here, it looks to be (probably) either good quality figured Tulip Wood or American Plum - although it would be fair to say that these veneers are generally a litle redder in hue than this example. Mind you, after the effects of natural light and aging are taken into account, a less red brown colour could easily be the end result. Nonetheless, it is a very attractive veneer in its own right, and it successfully complements the main picture superbly. The final item in this update is the reprint of an information sheet given out by the Buchschmid and Gretaux Wood Inlay Company around the mid term of the last century. 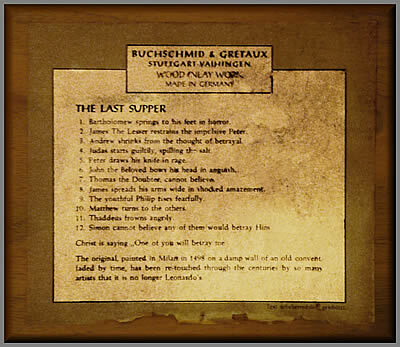 This information sheet not only gives a description of the process of producing a Wood Inlay picture, it also lists the most commonly used veneers by the Buchschmid and Gretaux Wood Inlay Company. Some of the veneers in the list may no longer be recognisable anymore. This is probably because of the export restrictions introduced over the last half century. Many of the "exotics" that we used to prize are no longer available to us. For instance, a veneer such as "Bronce Candle Wood" does not even appear in any listing these days. A name such as that was probably a 'local' nomenclature for what was then a commonly available wood or veneer. Unfortunately, what that particular wood actually was, well, we're afraid that we can't find any trace of it in our listings - and we have a vast and comprehensive veneer library to refer to! Even a search on Google only turns up our own web site as the source of information on "Bronce Candle Wood", so, unless some knowledgeable person can put us wise to this veneer, that will be another old variety that has bitten the dust. 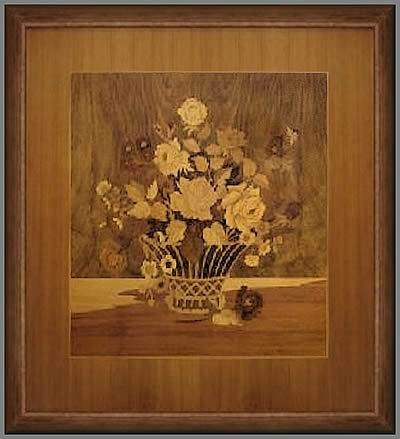 Wood Inlay Work is a fine art handicraft of medieval origin. It brings into effect the wonderful variety that the thousands of different kinds of wood all over the world shown in hues and grains. It is done with veneers, which is the trade term for thin sheets of wood. These are obtained by slicing up the very best trunks of the desired wood in specialized plants, burls, knots and roots show the finest and most vivid grain structure. The art of inlay work rests on very few eyes or hands. It will always remain impossible to mass produce. The finishing polish is alcohol and water resistant. It is cleaned like ordinary polished furniture. The following description explains to you the process of making on inlay picture. The process for tables and trays is very much the same. — After carefully scrutinizing the possibilities of a scenery for the specific requirements of inlay work, the artist first designs the contours of the picture on transparent paper, in lines only, without shadows. Blueprints of the drawing are then cut apart into all the pieces which later in the finished product will show the different wood colours. Each one of these pieces of blueprint is then pasted onto a selected piece of the right veneer taking care of desired grain structure and direction, and on a jig saw cut to the exact shape according to the confining Iines on the blueprint. 10 to 35 different veneers and 120 to 500 pieces in all are used for one picture. With tables the amount of pieces could be up to 2000. After cutting, these pieces are assembled by gluing them onto a piece of paper in the reverse sense of the intended picture. Both this paper and adhering pieces of veneers are turned upside down and the veneer side, under heat and pressure, glued onto a basic plate with precisely uniform thickness, while simultaneously a compensation veneer is glued onto the backside, thus forming the visible reverse side. — After this gluing process the paper layer that shows now on top is carefully sanded away. Under it there appears the reverse picture in the reverse sense, i. e. same as the original drawing. The wood of the veneer is then sealed off against environmental influences in a way that the wood pores still show and with them an inimitable feature of genuine wood. For tables a slightly different procedure completely seals the surface against attacks of spilt alcohol and other liquid, here the pores disappear under the finish, but the silk-like impression of the picture surface is maintained. Then the picture is framed, isolated against humidity seeping in and there is the finished product. Everything is handwork of highest skill, all materials ore of the very best quality available, all colours are natural wood shades with occasional sand burns for rounding effects. Click the above button to return to page 18 of "Can You Help"
Click the above button to visit page 20 of "Can You Help"